IN 1996 a moose jumped in front of my car, destroying itself and my vehicle. It almost destroyed me. This quintessential Canadian accident left me paralysed from the neck down. I was told that if I lived, it would be in an institution for the rest of my life. I was 23. I became neurologically disconnected from my body. No sense of temperature, touch, pain or pleasure; no control of bodily functions. I was intubated to force air into my collapsed lungs. Phlegm would build up in them and had to be sucked out. It was painful, terrifying, exhausting, and I was conscious through it all. Winking my eye was my only form of communication. After four long months of well-intentioned torture I could finally breathe on my own. I turned to issues that I felt strongly about but couldn’t tackle while in government. First on my list was doctor-assisted dying. After six months of consultations, I tabled two private member’s bills. The first would make doctor-assisted dying legal for competent Canadians over the age of 18 who are terminally ill, face chronic medical issues that cannot be relieved or have major disabilities. The second was about tracking doctor-assisted deaths and included measures to improve the quality of life for Canadians. It would create a commission to collect and analyse data on doctor-assisted deaths in Canada and report back to Parliament regularly. When I introduced these bills in the House of Commons in March 2014, there was silence on Parliament Hill. Politicians seemed to think it was a topic better avoided, especially with an election due in October 2015. But the Canadian people are years ahead of them: doctor-assisted dying has been widely debated in the media and around dinner tables. Opinion polls show a high level of support for doctor-assisted dying—among young and old, rich and poor, across religions and in all parts of the country. It is hard to think of anything that unites Canadians more—not even ice hockey or curling. The Supreme Court has spoken, too. Doctor-assisted dying first reached it in 1993 when Sue Rodriguez, a woman with motor neurone disease, fought for her right to a doctor-assisted death. It decided 5-4 that any doctor who gave her the help she wanted would risk prosecution. She went on to take her life secretly with the help of a doctor who has never been identified. This February, the court ruled unanimously in favour of doctor-assisted dying, striking down the ban on it and giving the government 12 months to create a new legal framework. The wording of the court’s ruling sets very similar parameters to those in my bill. A generation ago Ms Rodriguez asked, in a video statement to Parliament: “If I cannot give consent to my own death, whose body is this? Who owns my life?” The way I see it, the court answered, at last, that it was her body and she had the right to self-determination. This is a profound decision. It will bring peace of mind to many people. Someone with motor neurone disease ends up where I started off, drowning in their own phlegm. There is no getting better. It’s often a five-year slide from perfect health to death. Many sufferers kill themselves before they are no longer physically able to do so, fearing that their lives will be prolonged far into the stage of misery. But what if they have more years of health ahead? What if rather than steady degeneration, in their case they reach a plateau? For those who argue that doctor-assisted dying reduces the pressure to improve end-of-life care, I point to places where it is already legal: resources for palliative care and home care there have gone up. Some argue that doctor- assisted dying devalues the lives of those with disabilities; I argue the opposite. 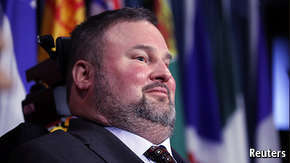 The ruling will allow people who are physically unable to end their lives on their own terms to decide how they wish to die—just as any able-bodied Canadian can. A competent adult Canadian who is disabled should have all the tools available to any Canadian to live well or to die well. Allowing other people to suffer hopelessly in no way increases the value of my life as a disabled person. If doctor-assisted dying had been allowed at the time of my accident, it would have brought me great peace of mind—to know then that I would not be forced to linger on and die a horrible death. Life can twist and turn. The people who told me after my accident that I would be institutionalised did not mean in Parliament. But in the end, a competent adult is the only person who can decide what is best for him based on his own life experience, morals, ethics, religion and everything else that makes up a soul. We can keep people alive for years beyond what they would have wanted. But simply to exist is not what everyone wants. In my first campaign I was asked in a radio interview why would anyone vote for me over these other candidates? My reply: “I would rather be paralysed from the neck down, than the neck up.” I am fortunate to live in a country where people want everyone to meet their highest potential, and where they vote for those abilities that exist from the neck up. I am empowered in my life. And my life is devoted to empowering others—including the empowerment to die.